The dining room of a Stabiae villa was filled with talk of art, politics, and gossip. When Mount Vesuvius erupted with “broad sheets of fire and leaping flames” in 79 AD, it buried in ash and pumice stones not only the cities of Pompeii and Herculaneum, but also the seaside resort community of Stabiae. Once the most luxurious corner of the Roman Empire, Stabiae boasted a string of opulent villas overlooking the bay of Naples where the Roman elite summered, entertained, and conducted business while strolling in elaborate courtyards. First excavated in the eighteenth century, the villas have recently been rediscovered, and a new set of excavations is under way. 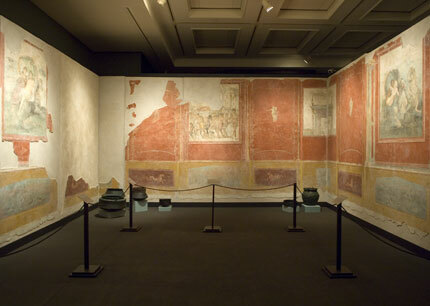 Original art from five of these villas—an impressive collection of frescoes, stuccos, household furnishings, and other antiquities—was displayed at the Michael C. Carlos Museum exhibit “In Stabiano: Exploring the Ancient Seaside Villas of the Roman Elite.” The exhibit, a collaboration between the United States and Italy organized by the Restoring Ancient Stabiae (RAS) Foundation and the Superintendancy of Archaeology of Pompeii, was the first time such ancient Italian artifacts have been on long-term cultural loan to American institutions. The Carlos Museum was the first southeastern venue on the four-year tour, which opened at the Smithsonian Museum of Natural History. Stabiae’s villas, with names like Arianna, del Pastore, and San Marco, have proven to be an astonishing archeological and historical find. Two thousand years ago, the villas were as much instruments of social power as retreats. The houses were surging with imperial families, their most powerful friends, and political hangers-on. They took their evening meals in tricliniums (three-couch dining rooms) and would discuss current events, business and personal affairs, literature, and works of art—often the very scenes and subjects portrayed on the room’s walls. The villa’s frescoes depict figures from classical mythology, allegories of the seasons, and winged putti (angels). Perhaps the most recognizable wall painting of the ancient world—a depiction of Flora, the goddess of flowers, filling her basket with freshly picked blooms—was a highlight.—M.J.L. June 16–October 14, 2007. The Carlos Museum will be one of three United States venues for the exhibition “Cradle of Christianity: Jewish and Christian Treasures from the Holy Land,” which traces the shared roots of Jewish and Christian beliefs and practices through biblical archaeology. Organized by the Israel Museum in Jerusalem, it contains significant biblical artifacts, including newly restored sections of the Temple Scroll from the Dead Sea Scrolls, the burial ossuary of Caiaphas the High Priest, and an inscription bearing the name of Pontius Pilate.